I was very hesitant to write this post but I think I should. Things have been quite rough here, and John and I are financially strapped. I also started back to grad school and a second job for the semester. We ended up, after two significant financial hits (one of which isn't resolved), starting a GoFundMe. It took all my willpower but we honestly had no choice. We have met our goal but we aren't sure how far it will carry us while we deal with crises at work and home. We're grateful for all of the support and care everyone has shown for us! The purpose of this post, though, is to let you all know that I will be super busy over the next few months and my energy is also incredibly low, but I'm doing my damnedest to keep involved and post. It will just likely be rarer. I hate that, but I only have so much of me, and I've already been struggling with physical and mental health, so I have to be careful. If there are things you think are super important that you want me to know about, feel free to tag me into them or email contactbriecs@gmail.com with anything like that. I also am happy to talk to people interested in doing guest posts (paid with the Patreon dollars). If there are smaller ways of contributing I can do, let me know. If you're promoting a project and would like to do a Quick Shot (three question) interview, go to the bottom of the Contact page to see how. I hope that you will all stick around as I muddle through an incredibly challenging time of my life, and continue to support me. I love you all and I want to keep bringing good things into your lives - and I will do my best to keep doing so. 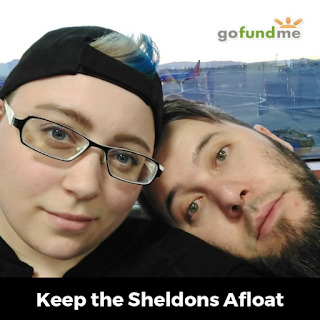 I'm sharing the GoFundMe, my PayPal, and other related things below. I know this is all very personal, but you all know I'm like that. Thank you all so much for being here!